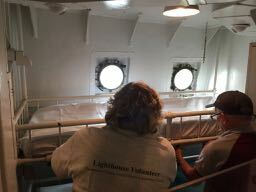 Workday: Historic Ships in Baltimore – June 3, 2017 – Chesapeake Chapter U.S.L.H.S. 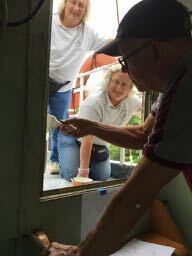 Lauren, Paula and Hobie work on door to half deck. We had a crew of six for our early June workday up in Baltimore. We finished up the work on the main bins down in the lathe room. We also cleaned, scraped and primed the doors to the Drill Press and work room below deck. A fourth coat of white paint was applied to the display cabinet. The cabinet had dark blue paint to begin with, so it has taken several coats to cover it completely. The repair to the door to the half deck fly bridge was completed and the door was painted. 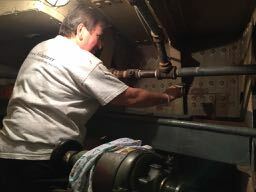 New sheets were put on the bunks in the crews quarters to smarten up the display. 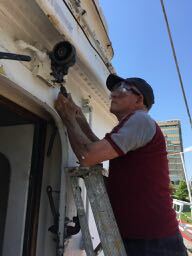 The officers cabin that we started on last time received more attention as we scraped some more of the peeling paint and then applied some primer to the exposed locations. Carolyn giving the last bins a coat of paint. Paula and Hobie setting up the crews quarters.